※ Regarding the distribution of reward items for this event, since it’ll be 2 weeks after the event ends, we humbly request for your understanding. Let’s send a fan letter to the person that’s on your mind! Depending on the number of obtained fan letters after the end of the event, we will be gifting items to all participating characters regardless of whom they sent it to. Who will win with the most number of fan letters obtained? We are hoping for your participation. Regardless of the results, all participating characters will be given gifts. From all characters that sent a fan letter, 10 of them will be given gifts through lottery. This time, the 2nd subject characters are the Near Soulworkers and NED Company NPCs. 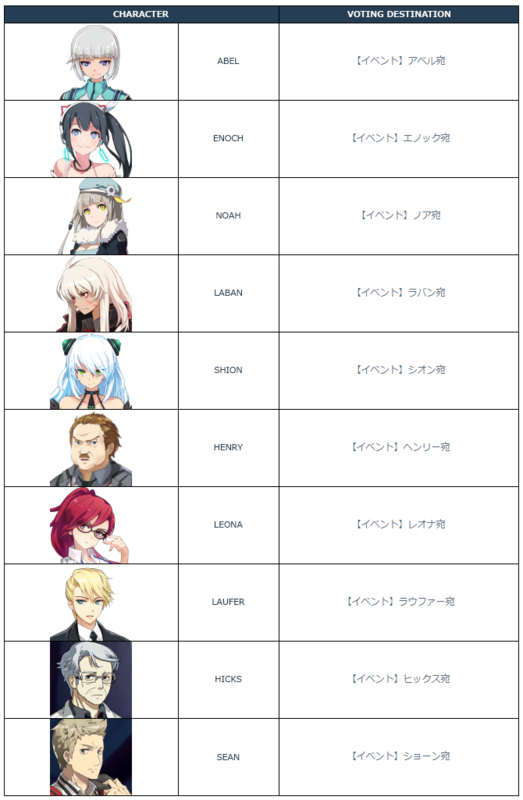 Voting will be completed by sending HEMS to the event characters you wish to vote. ※ If you vote more than once in one character, your participation to the event will be invalid. ※ You are free to write anything in the title and body when sending the mail. Note: If you wish to participate, you need to use JP IME. For example, if you wish to vote for Abel, you have send a mail to the recipient 「【イベント】アベル宛」. ・ This event will be on a per character basis. ・ If you vote more than once in one character, your participation to the event will be invalid. ・ Please abide by the rules when participating in the event. In the event that a fraudulent activity with the intention of obtaining the gifts and rewards, which is against the Terms of Service, is confirmed, the corresponding character will not receive the rewards. Furthermore, additional measures will be made against those players. ・ The 「Reward Item/s」 will be distributed by mail to the characters on the item distribution date. ・ The start and end time of this event may change depending on the maintenance time.